This is a long overdue post! It’s been two weeks since my inaugural sweeping gig at the Moosalamoo Ultra. I wasn’t sure if I should throw a last minute 36 miler into the mix, so I emailed the fabulous RD John Eyes. John suggested volunteering, with the bonus of running 22 miles. Done and done. 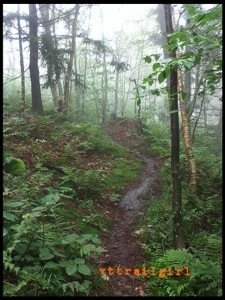 In its second year, the Moosalamoo is run through Green Mountain National Forest in Goshen, VT. There are 13 and 36 mile options. 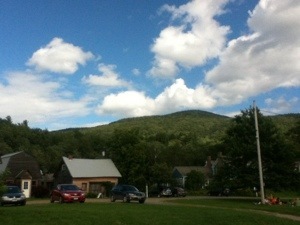 The start/finish is at Blueberry Hill Inn. The view and grounds offer enough of a view to warrant a visit. Beautiful. Hubby and I made a weekend of the race. 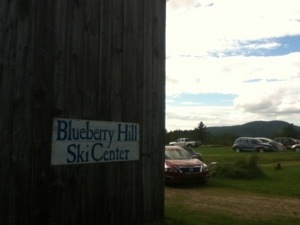 We camped at Blueberry Hill Friday with about ten other groups. If anyone reading has not yet taken part in this aspect of racing, I highly recommend you do. We met some great folks from around New England and Canada. Most were Ultra ‘experienced’. (Big ups to the Long Trailers on Meetup!). I love spending time with folks who want nothing more than to trade running stories. Guaranteed heaven for a running nerd like me. We talked into the evening, past this kid’s bedtime. So worth it. With six hours of sleep, and coffee made (I brought about five different kinds of camping coffee, just in case), I was ready for a little sweeping. Since I wasn’t racing, I took it easy and enjoyed my surroundings. Sweeping, I learned, is staying at the back of the pack, making sure no one is left out on the course injured or lost. Hubby and I also pulled course markings for about 15ish miles. Staying at the back was not a problem for me. I felt pretty slow, comparatively. The first loop was up Moosalamoo Mountain. Running was not an option for this girl. I guess I ‘power hiked’. Hahahahahaha. It took me 2:12 to ‘run’ seven miles. My morale was pretty low for a bit on the uphill. I ended up getting 20 minutes behind the last runners. Because someone got lost at last year’s race, John beefed up markings. Hubby and I had every pocket and inch covered with the flagging we tore down. Needless to say, the course was incredibly well marked and our arms were getting sore from pulling on the run. Oh yeah, rockin the full body workout. 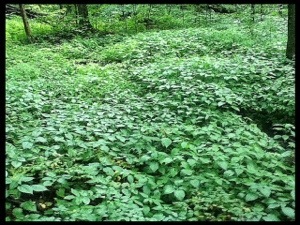 This picture is of a massive field of Stinging Nettle. It’s everywhere on the run. I rather think John is proud of its presence. After the mountain section, I made better time and caught up with the pack. I was able to settle in and enjoy myself. I hung out at three different aid stations and stuffed my face with Ruffles. Guiltlessly. Yet another perk of running long. Reckless chip eating. So good. Especially now that my stomach can handle semi greasy food while running. This is me making use of an abundance of flagging tape. We enjoyed an awesome barbecue post race. The weather was perfect. 72 and low humidity at the finish line. John and his family prepared ALL the post race eats, including homemade baked beans and multiple salads. I’m pretty sure both races were capped at a combined 150, making for second and third helpings. See where my priorities lay. I continue to learn how Astrid runs. Specifically, how to move through difficult patches. 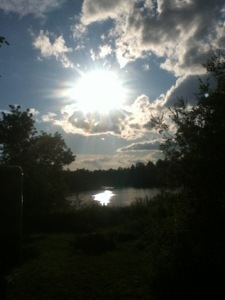 Beyond prayer, I found a ‘mantra’ that works for me on long runs. ‘I choose this’ works really well. Especially when I hurt and want to quit. Reminding myself that I have a choice keeps me moving forward. I used it a bit on the mountain section to stay positive. This year’s races were both sold out, so get your’s early for 2014 on ultrasignup. 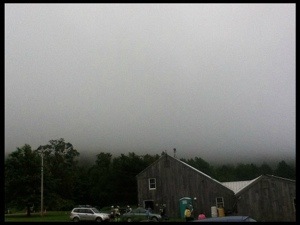 Its a weekend worth having, Vermont style. P.S. Five weeks til the VT50! Woohoo! 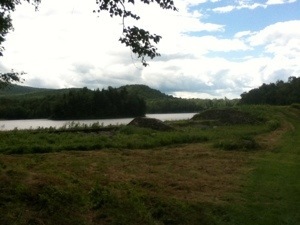 Last week’s running, post VT100 volunteering, were some of the best runs I’ve had. I felt strong, relaxed and capable. I’m not sure what changed, but I feel more determined than ever. Watching so many strong athletes do what needing doing, convinced me to stop navel gazing. 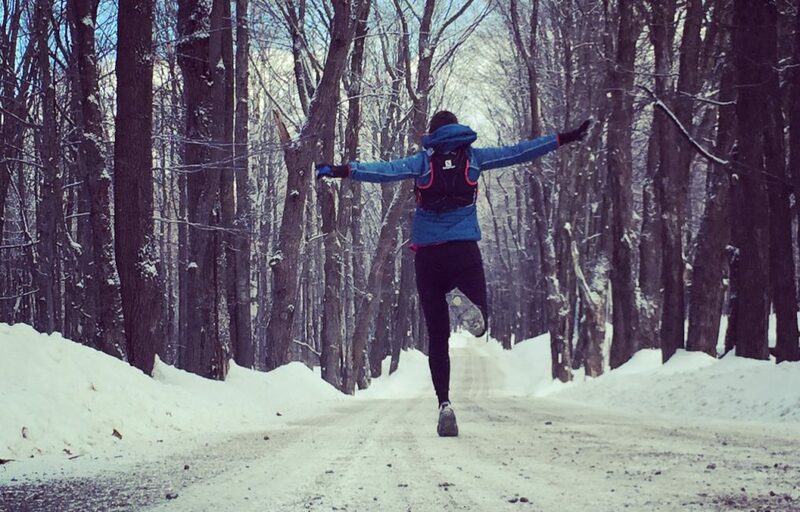 It’s time to clear your head, pokey trail runner. Just go. No excuses. Run this gift. Friday was the return of ‘Long Run Friday’. I ran a solid 24 miles. No bonking, no boo-hooing, no complaining. Best of all, no injury. Nothing hurt, beyond the usual next day soreness. Thank you, God, for clearing the path. New shoes helped, too. 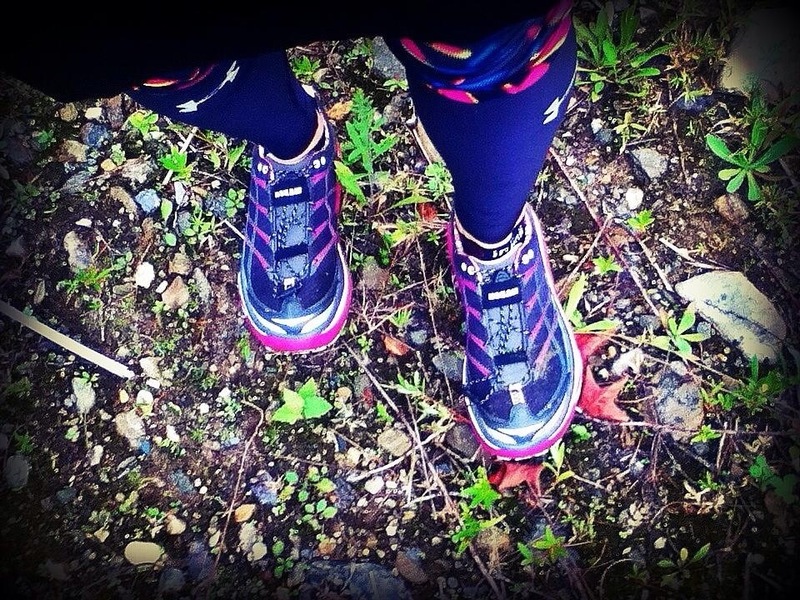 Thank you, Hoka, for making awesome shoes. (My Stinson had 550 miles, it was time for their retirement and replacement with the Mafate 3). 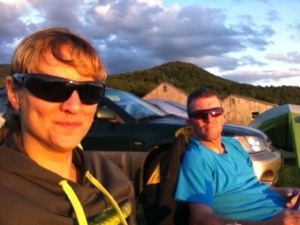 This weekend, hubby and I are volunteering at the Moosalamoo ultra in Goshen, VT. We’re sweeping the course, with the hopes of getting in 20-22 miles. Pretty psyched for new trails. 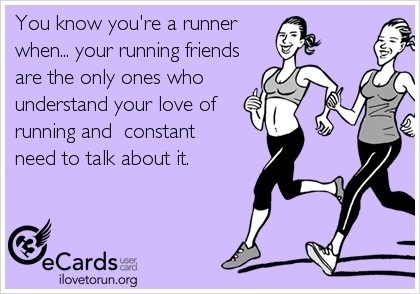 Yay, more miles and more runner peeps. My favorite kinda weekend. I promise a better photo session than my Vermont 100 post. And now, for something completely different…. I’ve been struggling with my writing here. Instead of slogging through self reflection, I’m going to share something else. Here’s a sampling of my favorite thoughts on running. Some you may have already seen. Others, well, I hope you enjoy them, too. But speed is not the only point. Racing is about pushing yourself — and to do so psychologically, having a watch may even be a distraction. Going fast is nice. But a time is not the goal, rather the best experience is what we strive for. I kept that thought in my head every time I looked at where my watch was supposed to be and reminded myself that time wasn’t the goal. The enjoyment of the experience, and all that goes with that…the pain of the climbs, the triumph of the summit and the freedom of the descent is what is most important. Sometimes it’s better to experience than to understand. 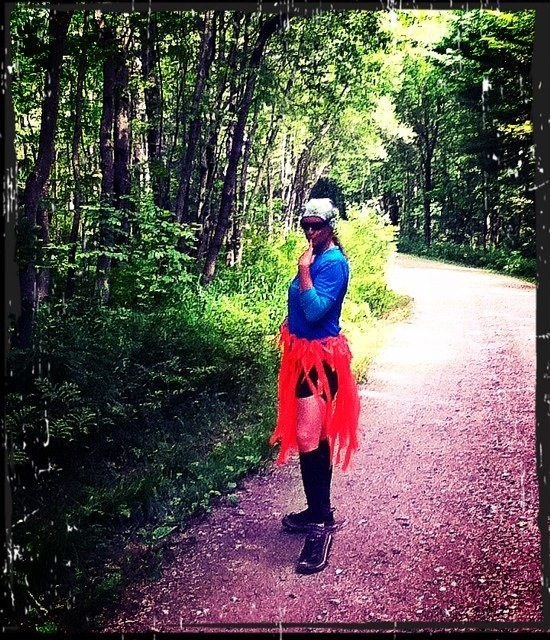 ~ Running and Rambling blog. I also realized that it made no difference how I looked when I started, just that I started. …..
Well, most days, the answer to that question is oblique at best and downright pathetic at worst, but if I have succeeded in getting in a run that day, the mundane, superficial, sometimes-hard-to-define stuff is a little easier to justify and that is why the long solo run is a place of such solace. When I am running, alone, on the trail, with only the sound of my breathing and my foot plants in my head I have no choice but to unitask. Nobody can call me, interrupt me, or usurp my moment. Is this selfish? Perhaps. Is this my way of detaching myself from the Real World? Certainly. Is this some sort of an “escape” for someone who can’t handle the demands of 21st Century society? I’ll let others be the judge of that. If you want to take the island, burn the boats….Whatever your boat is, burn it. Instead of protecting yourself so that failing won’t hurt, use that fear of failing as one more reason not to fail. And if you fail — and make no mistake, you might — I promise it’ll be good for you. While everyone was sitting on the couch watching Dancing with the Stars, you were out there trying. Making progress towards something. Doing instead of watching. You guys continue to inspire me, too. Please keep telling me all about it.